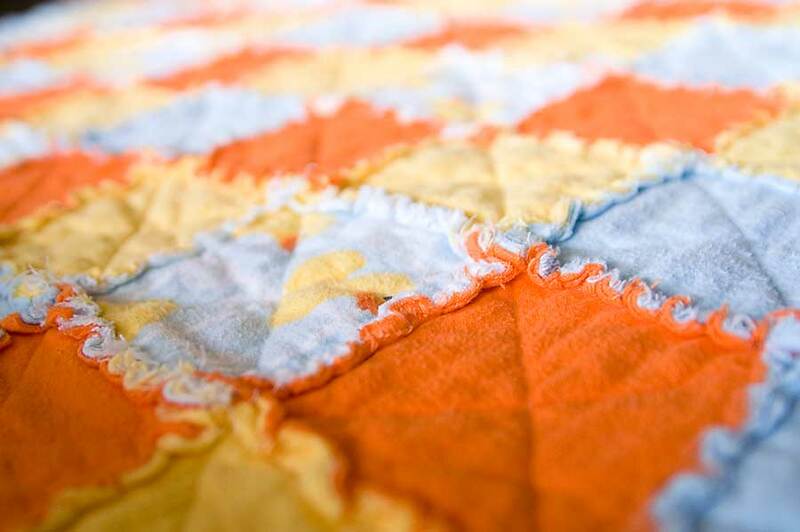 Ah, rag quilts. 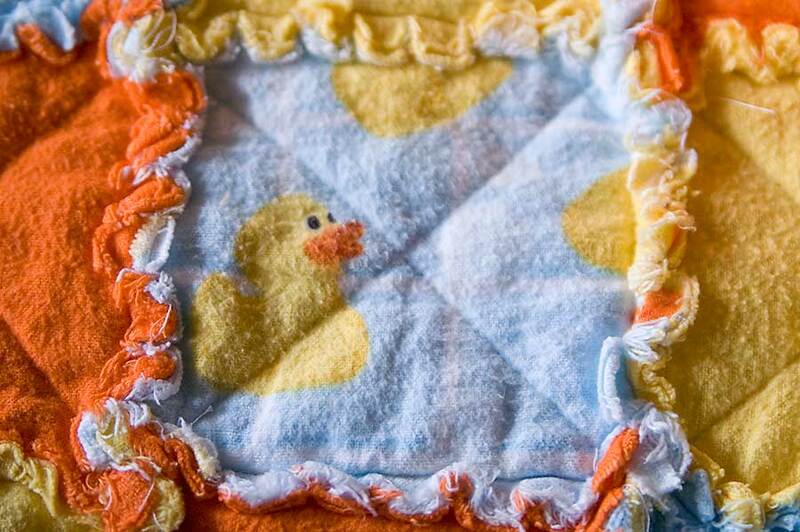 They're easy to make, soft and fuzzy, and are already quilted by the time the blocks are put together. 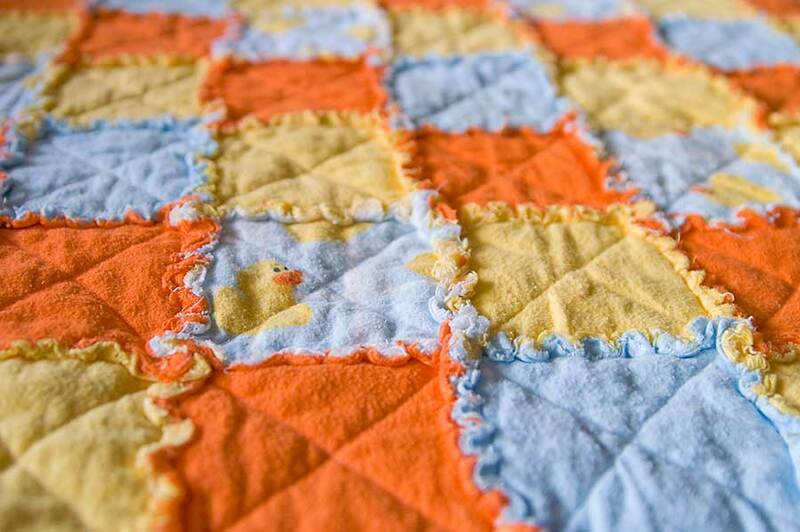 I made this rag quilt for Boo before she was born, and I thought I'd share it with you today. 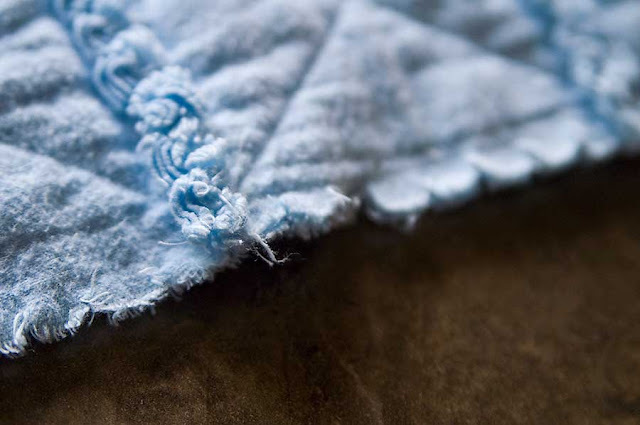 fabric that frays. I used flannel. I've also seen rag quilts made of denim. First, cut your fabric into squares. I cut mine to 5" square, and I cut out 110 squares. This made a nice sized baby quilt. Of course, you could use more or fewer squares, or make the squares larger or smaller--it's a very flexible project! Then cut your batting into smaller squares--take off 1" from the height and width. So I cut my batting to 4" square. 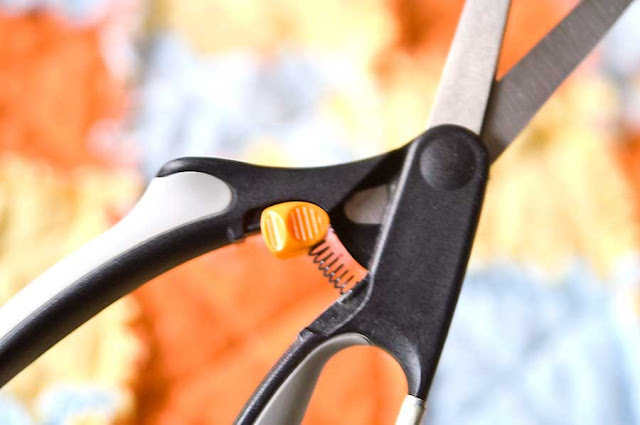 I just did this with scissors--precision isn't terribly important. You'll need half as many batting squares as fabric squares. Sandwich together fabric + batting + fabric, right sides of fabric facing out. You can pin them if you like, but they'll probably stay together just fine without pins. ...But a single diagonal line would be lots faster. You could even sew cute shapes, or just squiggle down the square. Once all your squares are sewn (and quilted! Isn't it nice to have that done already?) then it's time to put them together into a quilt. Take two squares and set them on top of each other, right sides facing out. (There may not be much of a difference between the two sides, in which case you just need to make sure your seams all end up on the same side of the quilt.) Sew them together, going over your sewing line from sewing around the squares. Continue until you have all your squares made into rows, then sew all your rows to each other. Now it's time to clip the seam allowances so the fabric frays nicely. Be sure you don't cut through your seams, though! I made my clips every 1/2" or so. You'll probably want to use scissors with a spring in them, to help your hands not get too tired out from making all those little cuts. 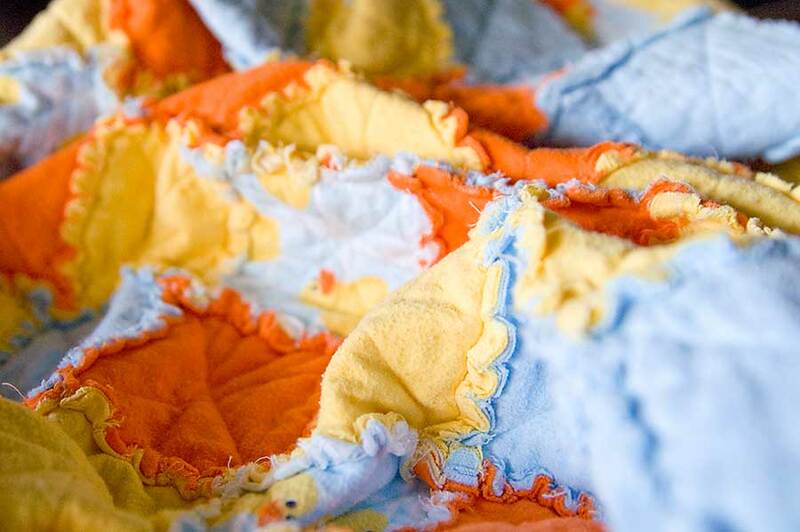 Now all that's left is to send the quilt through the washing machine to encourage the nice fraying-fluffyness. 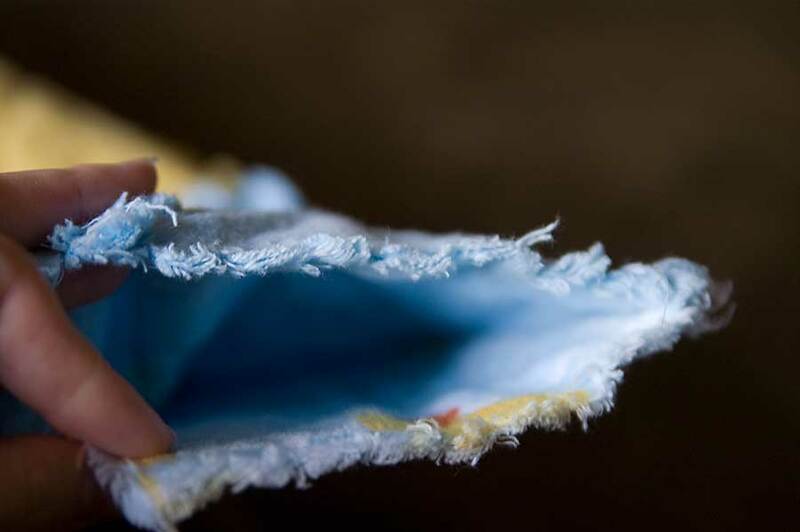 Wash it at a laundromat the first time or two--you don't want that much lint in your machines! After that, you can stick it in the wash like normal. I just realized another nice thing about making a baby quilt rag quilt style--all those baby-induced washings will just make the quilt all the more nicely frayed! Wow, it's so nice! I'm a new follower.